They’re all the rage, these whole roast cauliflowers. Though they end up browned on the outside after an hour or so of cooking, the inside is tender and flavoursome, essentially having steamed to perfection thanks to the vegetable’s high water content. It’s a satisfying and arguably show-stopping way of serving a vegetable that had dropped in popularity as kale, romanesco and co kicked on. Often these caulis are slathered in a yoghurty dressing (or two) and bejewelled with pomegranate seeds. On other occasions, and indeed at various restaurants I visited in Tel Aviv (where not bothering to cut up a cauli all began? ), they’re simply served plain, perhaps with tahini sauce and pickles on the side for self-seasoning. This spiced version stems from a recent ‘Spice Series’ piece written for Borough Market. Instead of leaving the cauli to its own devices, I decided to give it a coriander and cumin flavoured yoghurt marinade, which ultimately forms a crust on the cauliflower. Once cooked, the cauliflower is cut into segments and liberally doused with in a nutty, zesty rapeseed, lime and chilli dressing. Works both as a side (white fish, chicken or beef tagine / curry) and as a centrepiece in a mezze-style meal. Make sure you keep and use the greens as instructed. Pre-heat the oven to 200C Fan / 220C. Trim the greens from the cauliflower head, moving them to a bowl of cold water with which you can rub any dirt and dust off. Drain the greens and put to one side. Trim the stem of the cauliflower so that it’s level and will sit flat. 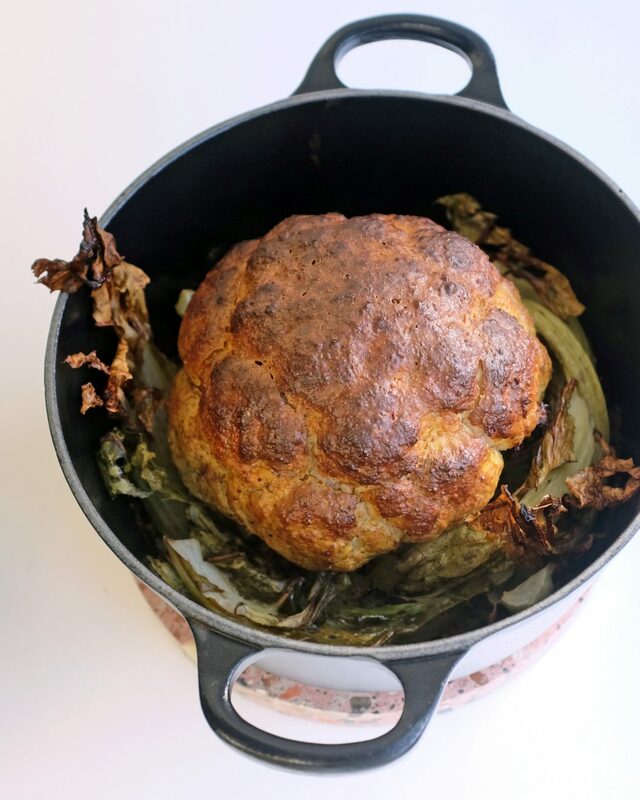 Find an oven proof pot in which the cauliflower will snuggly sit — ideally the sides will be about the same height as the cauliflower. Toast the coriander and cumin seeds in a heavy bottomed pan over a low heat, until they’re warmed and aromatic, but not burnt. Decant into a pestle and mortar, add a heavy pinch of sea salt and the chilli flakes and grind into a powder. Mix this into the yoghurt, along with the ground ginger, tumeric, lime zest and juice. With the cauliflower sitting upright in the centre of the pot, spoon the yoghurt marinade over the top. Pile most of it onto the middle of the flower — gravity will help it slip down the sides, evenly coating the florets. Place uncovered in the middle of the oven and cook for 30 minutes, during which time the yoghurt will bronze and set. Remove from the oven. Carefully sit the greens into the base of the pot, without disturbing the cauliflower. Add 100ml of water and return to the oven, cooking for about 35-40 minutes more. The cauliflower will be brown and crisp on the outside, tender in the middle. And the leaves will have softened in the middle and soaked up residual yoghurt flavours. Make the dressing whilst the cauliflower is cooking. Pour the rapeseed oil into a mixing bowl. Add the lime zest and juice, sugar and salt and pepper to taste. Whisk until emulsified, then throw in the remaining ingredients and stir together.